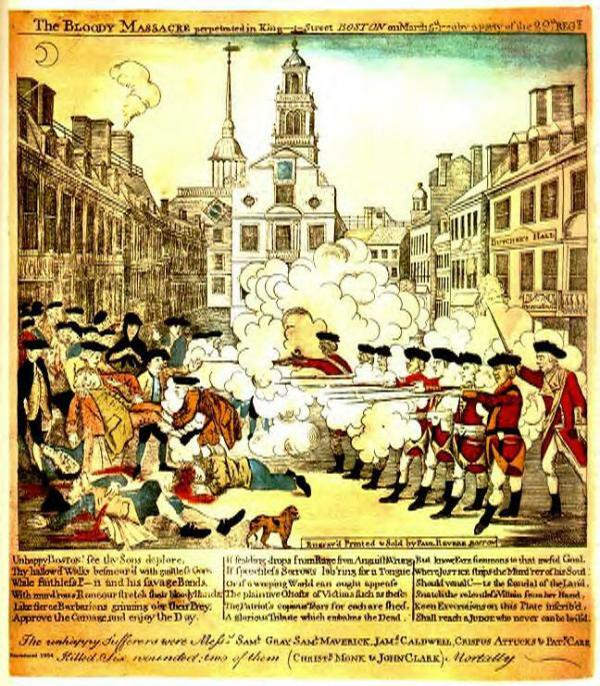 The Old State House (center background) as portrayed in Paul Revere’s engraving of the Boston Massacre, 1770. Mother Esther’s family connections in New England were politically charged, given that their country—and the monastery itself—were occupied by the British. 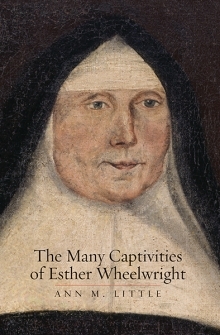 In fact, unbeknownst to anyone in the Ursuline community at the time, rumors were circulating in Boston that Nathaniel Wheelwright was suspected of working as a spy—this time for the French—and by implication, so was Mother Esther! On February 7, 1762, a little more than a year into Mother Esther’s first term as superior, a young man named Tuthill Hubbard walked to the imposing Georgian brick building now known as the Old State House in Boston, which was then the seat of colonial government in Massachusetts. This is the historic building now remembered most famously for its role in the protest against colonial government in 1770 that ended with British soldiers firing on an unarmed crowd, the Boston Massacre. But throughout its existence, the Old State House was the seat of power, politics, and intrigue. 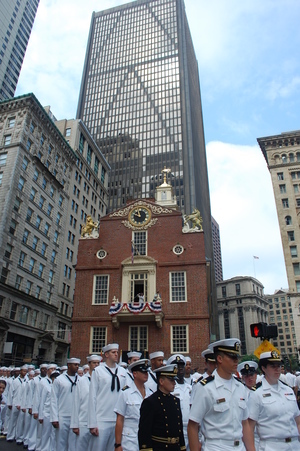 The Old State House today in Boston. There Hubbard testified before the Superior Court about a conversation he had witnessed more than two years earlier in Boston, shortly after the British takeover of Québec. In November 1759, Hubbard recalled that some of the officers who had been at the siege of Québec “say’d they had done themselves and country great honor & more than was expected from them considering the small number of troops they had.” Hubbard reported that “Capt. Arthur Loftus made Answer that it was true considering the Disadvantage that they labour’d under For the French very well knew their Numbers & every thing that pass’d & that a correspondence was carry’d on with the French From this Town by a person of Consequence.” In other words, this “person of Consequence” was a British or Anglo-American spy for the French. Hubbard continued with his testimony: “Capt. Loftus then say’d it was no less a person than Mr. Nathaniel Wheelwright.” Nathaniel, suspected of being a spy for the British in 1753–54 by the Marquis Duquesne, was now rumored to have spied for the French! Could Nathaniel have been sending information about troop strength and movements to the French through Mother Esther? This story seems too good to be true, with Mother Esther playing Miss Marple crossed with James Bond. It probably is too good to be true, although the allegation that Nathaniel passed intelligence to the French through Mother Esther reflects a few truths that are important to understanding immediate post-Conquest Québec, and to understanding the role of religious women in colonial politics. Fears of spies and spying were legion among both the British and French Canadians at this time in between the military conquest of Québec in 1759 and the 1763 Treaty of Paris, which finally ended the conflict. Anglo-American and British officers regarded high-ranking religious women with suspicion and fear, because they recognized how connected to colonial elites the women were. Captain Loftus and a Captain Small were only two among many officers to suspect religious women of political intrigue. As we have seen, the women who became choir nuns were from wealthy and even noble families. Their fathers and brothers were governors, colonial officials, and military officers; entering a convent and serving in its leadership were simply a means by which these women could serve king, country, and their faith, and their connections to colonial elites outside the convent were always well known. In fact, at the Hôpital-Général across town from the Ursuline convent at the very same moment, Mother St. Claude, the mother superior of the Augustinian hospital nuns there, was suspected by British Captain John Knox of spreading false rumors of French victories and British defeats among the officers they nursed there on both sides of the conflict. Recognition of their rank and connections outside the convent walls led British officers to suspect religious women, especially mothers superior like St. Claude and Esther de l’Enfant Jésus, of political intrigue. The allegations that Nathaniel Wheelwright was a spy went nowhere. General Amherst never hanged him, or even sent for him, though his story ends badly not long after Hubbard’s accusation. He was rich and married into a rich family, but his young wife died in 1764, leaving behind three children. Nathaniel declared bankruptcy the following year, and because of the extensive web of credit and debt in which he was heavily invested, this caused a regional financial crisis, which exacerbated the recession that had set in after the war. Nathaniel fled from his creditors in disgrace to Guadeloupe, where he died of yellow fever in 1766, an ending all too typical of the white migrants to the Caribbean who were usually either on the make or on their way down. Too bad for Nathaniel (about whom I’ve written here before). In addition to being a story about Protestant suspicion of Catholic religious people, it’s also a story about British and Anglo-American wariness of people who speak languages besides English. Nathaniel was among a very few New England diplomats who spoke French tolerably well, when his countrymen should have been more suspicious of his financial intrigues. I hope to do some blogging from the American Historical Association’s annual meeting in Denver this weekend. For those of you who just can’t hear enough about captivity in the colonial Americas, I’m chairing and commenting Friday afternoon on a panel called Rethinking Captivity in the Early Modern Atlantic World at 3:30 p.m.–stop by and hear all about the fascinating research in this field by my junior colleagues in this field.